Juliana doesn’t provide a lot of details about what happens during the day at school. The information we do hear is generally out of context – a random statement that makes little sense. I think this is common for her age. The main goal of the first 6 weeks of Kindergarten seems to be to understand how school works and learn the rules and routine. Activites and special programs are spread throughout the week (Spanish, Creative Arts (dance), Art, etc) so each day is a little different. The one consistant part of each day is morning meeting or the more familar phrase “circle time”. Morning meeting is one of the few topics that she will usually discuss after school. Since morning meeting is the one consistent part of the day, I typically ask what they talked about. Juliana, what did you talk about at morning meeting today? Did you also talk about stuff? If I want to get more specific I ask about the question of the day. Every morning they go around and each child answers the morning question and then they add up the responses. So far they have included questions about family – do you have any brothers, sisters, pets? and lots of “do you like” questions. 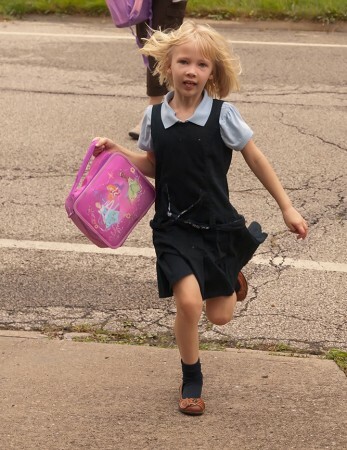 She couldn’t get her backpack open fast enough after school one day to show me the question; it was her day to bring it home. 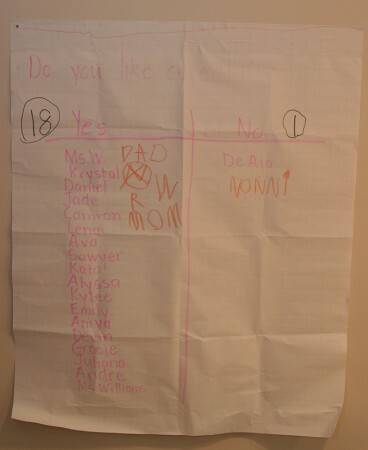 The question was “Do you like cereal?” with a result of 18 yes and 1 no. She hung it up on the wall and asked anyone who came in the house and updated the list. Bringing the question of the day home was very exciting for her. While we don’t have a lot of details about her day, I do know one thing – she doesn’t get to use enough of her words and doesn’t use up her energy. She bounces off the bus and up the sidewalk, incapable of simply walking and certainly unable to stay still…and the words don’t stop until she is a sleep. Sitting still and being quiet at school – I bet that is the exhausting part for her. Grama Julie loves cereal. How come my name isn’t on there. It IS in fact typical. . . and remains so throughout at LEAST the fourth grade. Beyond that I have no experience.